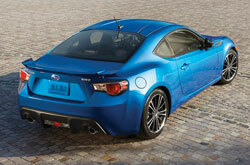 The newest sports car on the block is the Subaru's red-hot BRZ. With sleek styling, a powerful "boxer" engine and impressive handling capabilities, it's a force to be reckoned with. Don't take my word for it, though: listen to the Subaru BRZ reviews. AutoWeek writes, "The Subaru BRZ represents nothing less than the return of inexpensive, fun, front-engine, rear-wheel-drive sports cars." Car and Driver writes, "Ultimately, though, a car this good doesn't need to make sense: Its brilliance is all the explanation we need." Edmunds.com gives the Subaru BRZ its highest rating of "A" after putting it through a grueling 12-month extended test, determining that due to its great mpg numbers, sufficient power and remarkable handling, it's perfect for drivers seeking a well-balanced sports car. 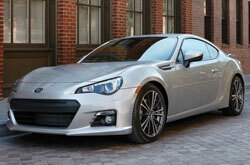 The 2014 Subaru BRZ in Kansas City is available in Premium and Limited trim levels for the new model year. Since it was released as a brand-new model in 2013, the BRZ's only upgrades include Aha Infotainment smartphone integration and improvements to its keyless start system. Kansas City Subaru BRZ drivers will be impressed with its standard 2.0-liter "boxer" engine, which produces 200 horsepower and 151 lb.-ft. of torque. Both Premium and Limited trims come standard with a six-speed manual transmission, but shoppers can opt for a six-speed automatic with steering-wheel-mounted shift paddles, if desired. During my 2014 Subaru BRZ review I found its interior to be just as striking as its exterior. And while I would've liked to see a little more legroom in the rear, driver and front passenger seating was spacious and comfortable. Standard and optional features include: keyless entry/push-button start, full power accessories, leather seats, heated front seats, heated exterior mirrors, dual-zone automatic climate control, navigation, an eight-speaker audio system and the aforementioned Aha Infotainment system. Visit Van Subaru to test drive the new 2014 Subaru BRZ in Kansas City and find out why drivers everywhere can't stop singing the praises of this affordable sports sedan. Compare the 2014 Subaru BRZ side-by-side with vehicles like the 2014 Mazda Miata, Hyundai Genesis Coupe and the Ford Mustang, and we're sure you'll see that the BRZ out does the competition in quite a few areas. If the BRZ's unique features and sharp looks don't convince you that it's the perfect vehicle for you, we're sure its affordable pricing will. Compare its price to the opposition and you'll see that it's a spectacular value, which is one of the main reasons why so many Kansas City drivers select it. 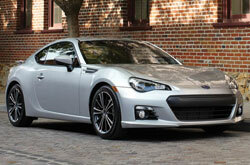 Get more details about what it offers - Take a look at our BRZ Quick List under this paragraph! The 2014 Subaru BRZ review above was penned by Van Subaru's automotive writers; for information about older models please view the links in the sidebar. Experienced automotive writers performed many hours of research to write the reviews on our site. As you read this article, you'll see that it is jammed with up-to-the-minute information about all the things you're looking for in the new BRZ - cabin amenities and other specs included. 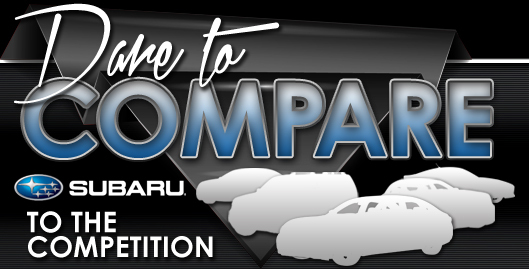 If the BRZ isn't a fit for you, please review and compare Subarus other finely crafted vehicles now.